Shepherd: A Memoir to be published in Spring 2014. Shepherd depicts this view of our pastures & a neighbor’s weedy fields, the road snaking below. I was fifty and the marketing manager of a university press when one day I decided I would write a book. My own book. The story I needed to tell. There I was, bent over a drawer in the press’s endless row of gray-green filing cabinets, and from the radio perched somewhere overhead I heard a writer, a man my age, talking about his latest book. What am I waiting for? I wondered. I’d noticed that one of our recent authors had attended something called a low-residency program for her MFA. We were publishing what had begun as her thesis. Slamming that cabinet drawer behind me, I headed for my computer to google her college. That’s what I’ll do, I thought. Keep my demanding day job, keep running our sheep farm on the side, knock out this book in a year, polish it for a year, and publish. I figured that picking up an MFA would be a nice bonus credential. Maybe I’d learn a few tips—couldn’t hurt. Boy did it hurt sometimes. But fourteen months later, I emerged with a 500-page manuscript, which I set about paring to 300 pages. The lessons continued as the years went on, post-MFA. The pains now seem trivial and passing compared with the joy of learning and of creating. 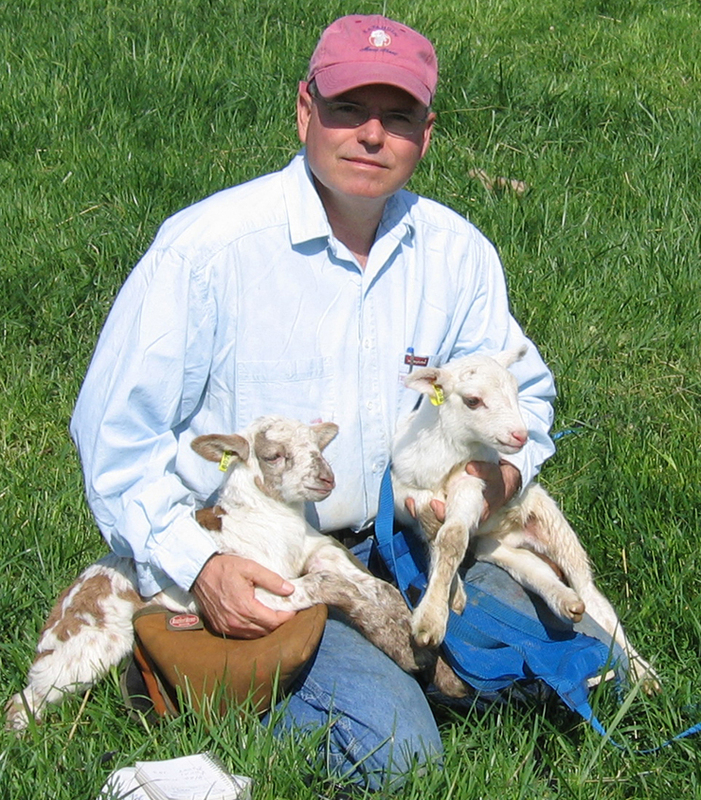 Happy day: me with Freckles’s 2006 twin lambs. 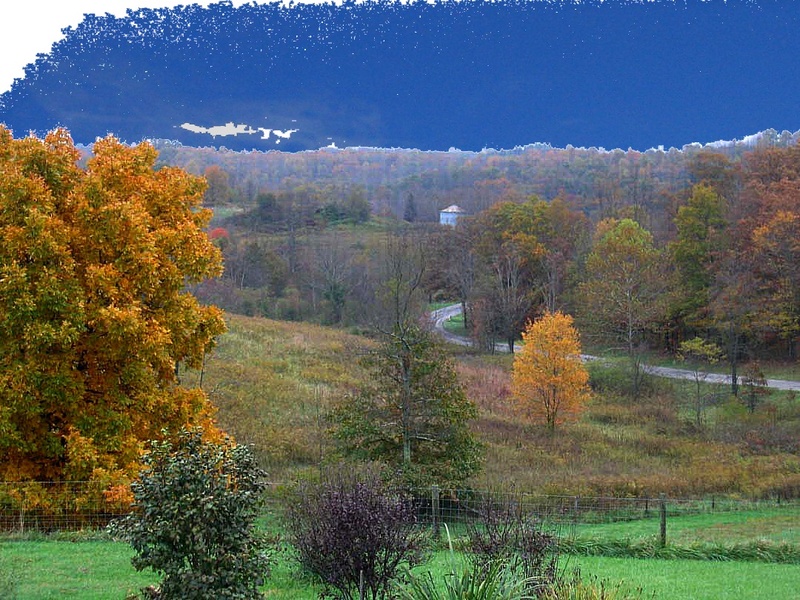 The book, a memoir, is about how I, a guy who grew up in a suburban beach town in Florida, ended up operating a sheep farm in the Appalachian hill country of southern Ohio. It’s about my obsession with my charismatic, distant, farming father and about my father’s traumatic sale of our family farm when I was six. It shows how I was even more scarred by something else—the effect of my grandfather’s suicide on my father—but that I couldn’t see that. It depicts the upheaval I put my own family through as I tried to become a farmer myself: how I got into financial trouble, struggled with fatal and disgusting sheep ailments, and got seriously hurt trying to save a dying ewe. In the wake of my injury we sold our first farm and retreated to a neighboring property bought in my early lust for land. Finally I became a respected shepherd and supplier of breeding stock. My story wasn’t quite so crystallized at the start, especially its emphasis on my father. 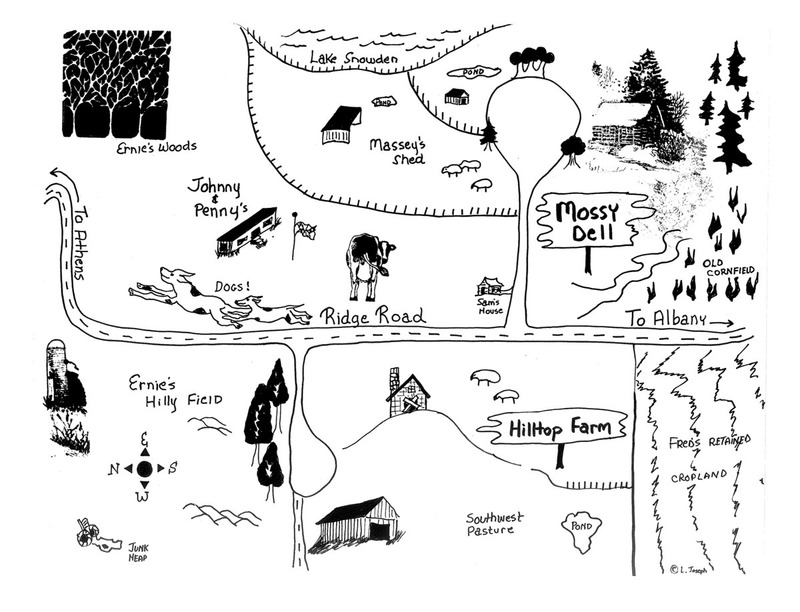 What I really wanted to do—and this was my project’s worthy seed, I believe—was to try to explain, so someone else would understand, what it was like to win Mossy Dell, the farm of my boyhood dreams, and then to lose it. That’s really what my literary ambition came down to. I yearned to tell about losing a magical farm so that someone else would understand. Now, after seven-plus years of work on that book, I’ve just signed a contract to publish Shepherd: A Memoir with Michigan State University Press. The book is due a year from now, in Spring 2014. Next: My first lesson on the path to publication. The rural neighborhood of Shepherd: A Memoir. Frontispiece map copyright Laura Joseph. Wonderful news! Can’t wait to read it! I can hardly wait. Wonderful news, Richard. Richard: Congratulations on a huge achievement! I am so happy for you! Like you, I’ve always believed that there’s a book in me, and I always tell myself that I’ll get started when I get my kids launched in the world, or when my job in higher education is finally safe – like that’s going to happen. Like your writer on the radio, maybe you’re lighting the way for countless others! I hope one of them is me! Hi, Julie! How great to hear from you; I was actually thinking of you today for some reason, maybe because my mind has gone back to Bloomington and Indiana years with this event. I KNOW there’s a book in you. You are a writer first, last, and always. Until you can get the decks cleared to start, read—and I know you are a reader!—books like you hope to write. I will be glad to help in any way I can, if only to cheer you on. Richard — I was happy to see this news in the recent Goucher email, and am glad to know I was around to read the early bits of this project. I’ll be in touch — would love to put together a profile for the WordPress.com News blog. Very exciting! Congratulations! I look forward to reading it! Congratulations, Richard! As they say, “All good things come to those who wait.” In this case, it’s not “those who only stand and wait,” as Milton had it, but “he who suffers, and revises, and rethinks, and recreates again and again until he is sure he can commit to publication.” And that’s a major feat. Kudos! Congratulations! cheers to your book! Thanks so much, Elizabeth and Victoria. I hope you’ll like it! Congratulations that your seven years of effort paid off. But, I am wondering how long it took you to figure out “what about what it’s about?” (Barrington) Did you know early on (before you started), or did it come to you gradually with each draft? I never know early on, and always struggle until I think I know. I suspect this is a common dilemma. I think its themes clarified with each draft, Richard. Near the end I made myself a statement: “This book is about loss, dreams, fatherhood, and farming.” I think few, if any writers, know everything going in, and I place a high premium on discovery. I created so much that was cut, and then years later would see a bit I needed and go back to a previous version and grab it. Writing the book actually helped me see how big an influence my father had, even bigger than I’d supposed, and not only did I idolize him I realized very late in the process of writing the book, because of a dream, how competitive I was toward him as well. That did not go in for a while and then did. All this clarified together, my understand AND my book. Congratulations, Richard, on completing a marathon in which the finish line kept moving farther and farther away. A super achievement! This blog, its urgency, steady fervor and insight into the art has earned you readers. Dewitt, yours is the most concentrated praise I’ve ever received—not just about this blog. Probably in my life! Thank you is inadequate, but thank you. I am going to quote this on my about page. This is great news. I read it first over on Bill’s site. I can’t wait to read your work! Congratulations! Thanks so much, Tim. Nice to hear from you. I am so happy for you! I look forward to learning more about your life… and making more discoveries about the art of writing through what is sure to be an exceptionally creative, insightful and rewarding read. I appreciate that, Jennifer. As a faithful reader of your wonderful blog, I hesitate you’ll learn about writing. But I hope you will enjoy the story. Richard, you’re a pied piper for all of us who feel we have a story worthy of telling, the hope of finding publisher who believes in us and the dream of an enthusiastic audience eager for launch day. Thanks for leading the way. How nice of you, Deborah. Good luck and best wishes from this pied piper! Congratulations! The story that you describe sounds intriguing and that it will offer a lot of insights for readers. I look forward to it! You can expect me to ask you some questions I will post on my blog! Thank you, Racheal. Bring on the questions! I have more of those than answers, but will try to help. I was so excited to read this wonderful news! Congratulations, Richard, and congrats in advance to the lucky publisher who was smart enough to snag you. Please let me know if there’s anything I can do to help. Richard, you are an inspiration with every thought you share. Our memoir writing group is using your blog posts as discussion items, and we all love the clarity and the passion you bring to each topic. I’m sure your memoir is just as inspiring. Looking forward to its publication. On another note:remember the post about the 4th draft? After reading it, I got enough courage to pull out a first draft memoir I had written four years ago, and dust it off for the first time. So delighted to hear this news, Richard. I love the title and the themes of your book–and the map. Our stories have so much in common. So glad I found you so soon after I became a blogger. I agree with DeWitt, above. I too am amazed at how long it took to get to the publication stage. But what rewards. Extracting wisdom from experience takes huge energy. I can’t wait to buy this book. Thank you for these words and for your constant support, Shirley. Finding your blog was of such great comfort and help to me. I am traveling so am late to respond. But I am thrilled for you, Richard. I never doubted you would do it. Hope you can make it down to NOLA for a book event. If you even get close to the South, I will try to make it. Sames goes for you, Shirley. Thanks, Darrelyn! I have not even done a happy dance myself yet! Maybe when I actually hold the book and believe it? I was hesitant to announce because I have not yet received my counter-signed copy in the mail, and I think my editor thought that was weird—she accepted the book and her board did, and she’d told me that. I will check into NOLA. I only wish I was living in the south, not only my home but because of the way the south gets behind its writers. In Ohio, Cleveland turns up its nose at a writer from Columbus and Cincinnati is likewise its own world. So happy for you and proud of you! Thanks, Paulette. You have been such a help, especially in reading and critiquing a whole version! I made one very key change as a result of your comments; can’t remember if I mentioned it at the time, may have taken a while to see it, but it improved the book that extra percent. Richard, I am a faithful reader of your excellent, insightful blog even though I don’t always leave comments. I refer people here whenever I teach workshops. I’m thrilled for your publication announcement and look forward to reading the book. Many congratulations! P.S. I also like the blog’s new name. Thanks, Marsha, and for endorsing the blog’s new name. I am still not sure, so it’s nice someone has mentioned liking it. Thanks, Kassie—I will ask my publisher to get you a review copy when books are ready. Congratulations Richard! Thanks for sharing your story. Looking forward to more tales of your journey ! I appreciate that, Christin. More bits to come, of course, and then finally and unbelievably: the book! Congrats! There are few moments more exciting than knowing you’re going to publish a book, so enjoy every minute of it. Memoir is a little (or maybe a lot) like therapy. I discovered many things I didn’t consciously realize when writing my own (focused on working retail for a while). Writing about private feelings for public consumption is very difficult to do well. Thanks so much, Caitlin. I agree with your latter comment: getting my persona right, which includes letting readers in, treating them as friends, was hard as heck for me! Congratulations, Richard!!! So exciting and wonderful to see all your good work turning into a real, live book. I love the title (and the picture at the top). Yay! The map was an idea from one of the press’s anonymous readers and I jumped right on it! It will help readers and adds some charm. Richard, your post made my day. It was one of those “moments of being” that make one happily smile all day long. Why? When I try to explain, it sounds banal: It’s so much joy to see that there exists some justice in this world, and good people are rewarded for hard work and devotion. Anyway, thank you for your wonderful blog, and I can’t wait to buy your book. Thanks, Olga. Great to hear from you! I hope you’ll consider another guest blog post.